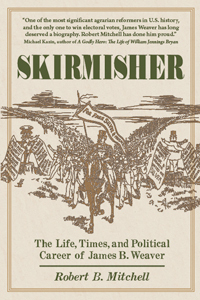 Skirmisher: The Life, Times, and Political Career of James B. Weaver tells the story of a 19th-century politician whose two campaigns for the White House helped change the course of American politics. This book, the first full-length biography of Weaver in almost 90 years, offers the reader a panoramic view of some of the great events of the 19th century – the California Gold Rush, the Civil War, and presidential politics from the election of Abraham Lincoln in 1860 to the rise of William Jennings Bryan in 1896. Skirmisher also sheds new light on the role of religion in American politics and the influence of third parties in presidential elections.